In conclusion, we have demonstrated a strong association with the rs422951 and rs72555375 NOTCH4 polymorphisms in two independent sIBM patient cohorts. These polymorphisms can be regarded as markers for sIBM susceptibility and warrant further investigation. In summary, high-resolution HLA-DRB1 genotyping has shown that in this s-IBM cohort allelic heterogeneity at the HLA-DRB1 locus has complex effects both on disease risk and the clinical phenotype of the disease. Our findings confirm that HLA-DRB1*03:01 is the major risk allele but show that other alleles may also have positive or negative risk effects. Moreover, interactions between the two complementary DRB1 alleles affect disease risk and severity, with the highest risk being associated with the HLA-DRB1*03:01/*01:01 diplotype and other allele combinations having diminishing risk effects. Collectively, these data establish that humoral autoimmunity directed towards selfantigens is present both in the periphery and at the site of tissue damage in IBM patients. Taken together, our description of antibodies directed against self-antigens suggests that there is a humoral autoimmune component in IBM -- at least in a subset of patients. Our results should trigger investigations that would set out to identify and validate additional autoantigens and determine whether such autoantibodies participate in disease pathology and if they can serve as useful diagnostic or prognostic biomarkers that are lacking for IBM. Additionally, investigations regarding the mechanism and functional effects of the humoral branch of the immune system in IBM pathophysiology need to be initiated. 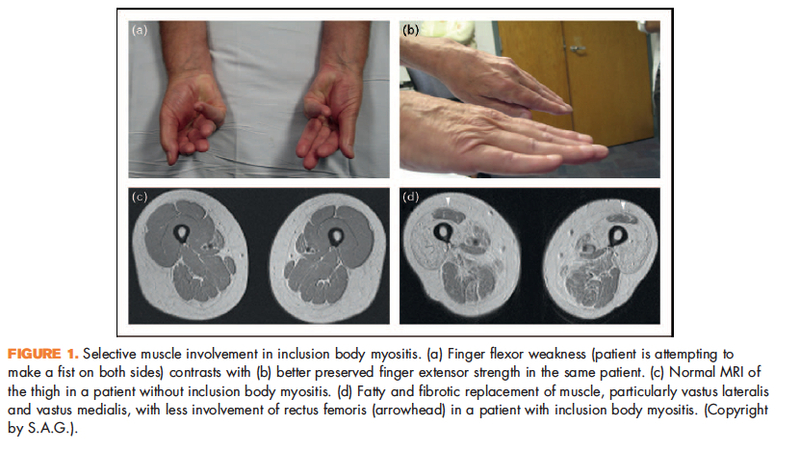 Muscle Aging, Inclusion-Body Myositis and Myopathies, Valerie Askanas, W. King Engel (Eds. ), Wiley-Blackwell, ISBN: 978-1-4051-9646-8. Overall the book is a good introduction for those new to these interesting neuromuscular topics. However, as many of the pathological aspects of IBM remain unresolved and controversial it would benefit from a more critical analysis of the literature. In conclusion our study demonstrates significantly enhanced myo-regenerative processes in s-IBM concomitant to inflammation and vascular reorganization. Although Pax7+ satellite cells may increase to a similar extent as in other inflammatory myopathies, an altered expression of myogenic regulatory factors that govern activation and differentiation of myogenic progenitor cells as well as morphological abnormalities of regenerating fibers suggest an impairment of the complex regulation of myogenesis and coordinated tissue repair in s-IBM. In summary, the present results demonstrate that Abeta accumulation within skeletal muscle leads to considerable alterations in mitochondrial structure and function that precede other reported aspects of IBM in the MCK-beta APP transgenic mice. The functional interplay between the disrupted cytoplasmic Ca2 handling and diminished mitochondrial function in Abeta-affected muscle could potentially serve as therapeutic target for the treatment of IBM and other Abeta-mediated disorders. In conclusion, this population controlled study has shown that in this s-IBM patient cohort the frequency of nonspecific MAA and other autoimmune diseases is higher than in the general population, whereas the frequency of MSAs and other organ-specific AAbs is not increased. The findings provide support for a disturbance of immune mechanisms in s-IBM and suggest that further studies of immune function may be warranted. Our recent studies show that neuromuscular synaptic transmission is defective in animals that express the Abeta-peptide and suggest a specific defect at the nicotine acetylcholine receptors level. Biochemical analyses show that copper treatment increases the number of amyloid deposits but decreases Abeta-oligomers. Copper treatment improves motility, synaptic structure and function. Our results suggest that Abeta-oligomers are the toxic Abeta species that trigger neuromuscular junction dysfunction. We again propose that s-IBM is not a primary dysimmune/inflammatory disease but that the accumulation of posttranslationally modified, misfolded proteins in aging milieu of s-IBM muscle fibers, can be perceived as "foreign" (not self) and may be responsible for inducing a T-cell immune response in the s-IBM muscle. 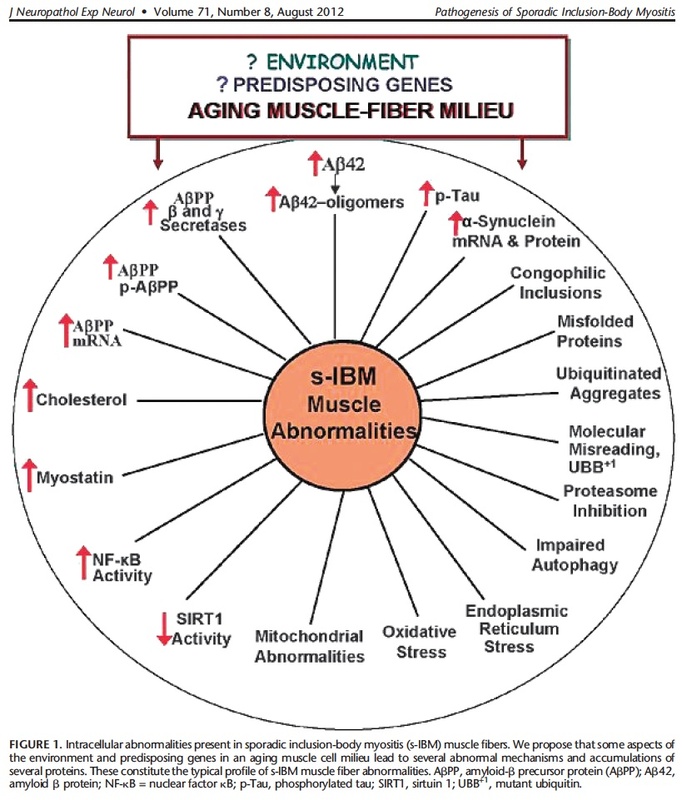 In conclusion, s-IBM is a degenerative muscle disease associated with abnormal myoproteostasis, in which aging seems to be a key risk factor. 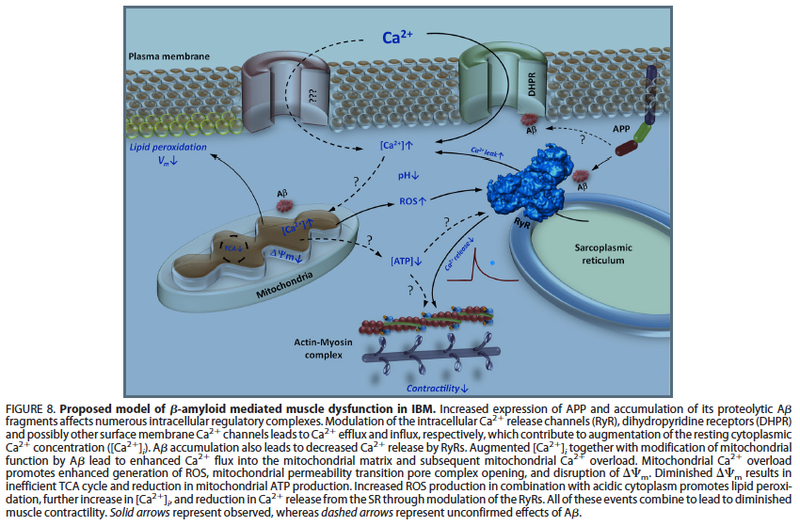 Several molecular mechanisms responsible for multiprotein aggregation and accumulation within s-IBM muscle fibers were reviewed. We again propose that s-IBM is not a primary dysimmune/inflammatory disease but that the accumulation of posttranslationally modified, misfolded proteins in aging milieu of s-IBM muscle fibers, can be perceived as 'foreign' (not self) and may be responsible for inducing a T-cell immune response in the s-IBM muscle. Because antidysimmune treatments are essentially not effective in s-IBM and have even reported to be detrimental (4), other therapeutic measures are needed. Some are suggested herein. In this paper, we summarized current knowledge on the involvement of the TNF superfamily of cytokines in IM, finding ourselves humbled by the lack of data regarding some of them. Figure 1: Potential roles for tumor necrosis factor cytokines in themuscle damage associated with dermatomyositis. Based on current knowledge, a model is developed describing the possible involvement of tumor necrosis factor (TNF) cytokines in the sustained inflammation in perifascicular regions of muscle. Activation of the complement system leads to membrane attack complex (MAC) deposition on blood vessels and subsequent necrosis. Endothelial monocyte chemoattractant protein-1 (CCL2) recruits inflammatory cells that accumulate and organize in perimysial areas. Lymphocytes organize into functional compartments and produce lymphotoxins (LTs), TNFapha and CD40L, which further recruit responsive immune cells fromthe circulation, leading to the buildup of perimysial inflammation. Dendritic cells (DCs) produce IFNapha, which stimulates muscle fibers to secrete B-cell activating factor (BAFF). The latter activates B-cells that, in response, begin to produce autoantibodies. 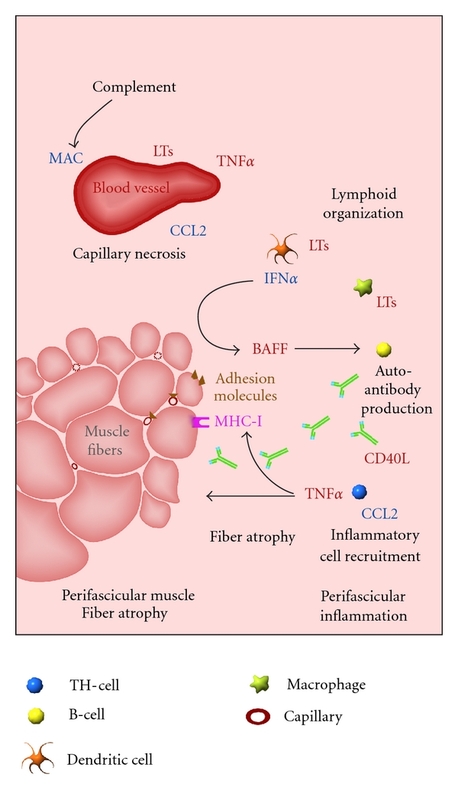 TNFapha, mostly produced by Th-cells, provokes muscle fiber atrophy and stimulates major histocompatibility complex I (MHC-I) and expression of adhesion molecules. In summary, our data underscore the relevance of a specific interplay between inflammatory and b-amyloid-associated pathomechanisms in sporadic IBM. 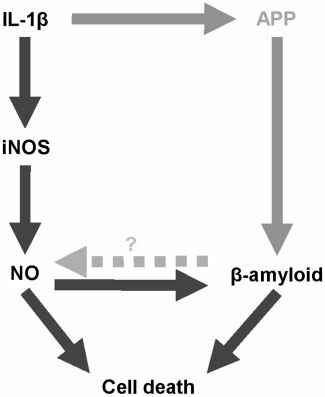 Upregulation of iNOS with subsequent production of nitric oxide may be a key event in this pathological network (Fig. 7) and act in concert with endoplasmic reticulum overload and other cell stress pathways to trigger and augment accumulation of b-amyloid (Schmidt, 2010; Schmidt and Dalakas, 2010). The data profoundly further our understanding of the pathology of sporadic IBM and identify regulation of iNOS as a promising target for future therapies. Our demonstration of NBR1 abnormalities in s-IBM further suggests that altered protein degradation pathways may be critically involved in the s-IBM pathogenesis. Accordingly, attempts to unblock defective protein degradation might be a therapeutic strategy for s-IBM patients. Tumor necrosis factor-like weak inducer of apoptosis (TWEAK) and its receptor Fn14 exert pleiotropic effects, including regulation of myogenesis. Sporadic inclusion-body myositis (IBM) is the most common muscle disease of the elderly population and leads to severe disability. IBM mesoangioblasts, different from mesoangioblasts in other inflammatory myopathies, display a myogenic differentiation defect. The objective of the present study was to investigate TWEAK-Fn14 expression in IBM and other inflammatory myopathies and explore whether TWEAK modulation affects myogenesis in IBM mesoangioblasts. TWEAK, Fn14, and NF-KB expression was assessed by immunohistochemistry and Western blot in cell samples from both muscle biopsies and primary cultures. Mesoangioblasts isolated from samples of IBM, dermatomyositis, polymyositis, and control muscles were treated with recombinant human TWEAK, Fn14-Fc chimera, and anti-TWEAK antibody. TWEAK-RNA interference was performed in IBM and dermatomyositis mesoangioblasts. TWEAK levels in culture media were determined by enzyme-linked immunosorbent assay. In IBM muscle, we found increased TWEAK-Fn14 expression. Increased levels of TWEAK were found in differentiation medium from IBM mesoangioblasts. Moreover, TWEAK inhibited myogenic differentiation of mesoangioblasts. Consistent with this evidence, TWEAK inhibition by Fn14-Fc chimera or short interfering RNA induced myogenic differentiation of IBM mesoangioblasts. We provide evidence that TWEAK is a negative regulator of human mesoangioblast differentiation. Dysregulation of the TWEAK-Fn14 axis in IBM muscle may induce progressive muscle atrophy and reduce activation and differentiation of muscle precursor cells. The results of the present study provide first evidence that TWEAK is a negative regulator of mesoangioblasts differentiation, and furthermore suggest that TWEAK- Fn14 interaction may regulate mesoangioblasts functions. Blocking TWEAK-Fn14 activity, therefore, may restore mesoangioblasts myogenic capacity in the IBM diseased muscle. CONCLUSIONS: Together, these data provide strong evidence for an antigen-driven, major histocompatibility complex class I restricted, CD8+ T-cell-mediated attack against peripheral nerve tissue components contributing to the pathogenesis of CIDP.